For most people, planning any event can bring on nightmares of showing up in your underwear and all kinds of other things that probably won’t happen. When planning a wedding, this can easily be magnified by the size of the event and level of stress you are able to handle. And if your imagination is vivid enough you will imagine fires being set by candles, gobs of food staining your bridal gown, the groom passing out, and some other equally horrific events. The truth is that some of your worst nightmares can come true if you don’t plan ahead. ZOMBIE BRIDE – Not getting enough sleep, dirnking too much alcohol or caffeine or Red Bull can temporarily affect the way you look. To avoid dark circles, use the days leading up to your wedding to relax and implement healthier eating. TEXAS CHAINSAW BRIDE – This is not the day to do a complete makeover. You want to look like a very pretty version of yourself, not a over-processed, over made-up, over-the-top version of yourself. If you look into the mirror and don’t think you look like yourself, you might want to tone it down a bit – leave the big hair to the Texas beauty pageants. JACK O’ LANTERN BRIDE – Spray tans and self tans can turn out the be the wrong color for your skin and there is very little you can do to fix it at the last minute. Don’t experiment with a new bronzer on the day of your wedding, either. Orange is perfect for Pumpkins but not so much for bridal photos. BRIDE OF DRACULA – What makes a great photo? A great smile! Even Dracula knows that yellow teeth can ruin the best outfit. 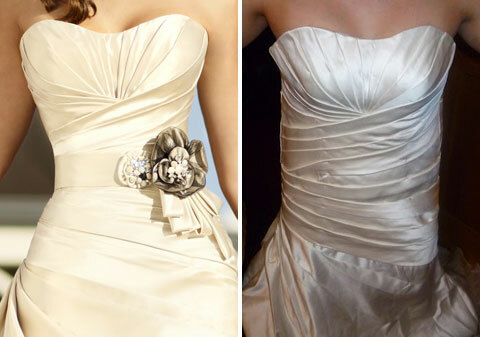 DISAPPEARING BRIDE – To be early is to be on time, to be on time is to be late. Plan ahead, traffic and construction can give you a migraine on the day of your event! No matter what your worst nightmare may be, planning ahead and attending one of our Luxury Bridal Expos will help you avoid the horrors of wedding planning. There is something very special about the relationship between women and their shoes. For me, it is red shoes; anything from a light, orange-y red to a burgundy red, from a smooth patent leather to a buttery suede, I gasp every time! For wedding shoes it goes double. Almost as important as the gown is what to put on your feet. Because the right shoe will give you every reason to slightly lift the corner of your ball gown and show everyone your sassy little secret! If I had known then what I know now, I would have gladly worn red shoes on my wedding day … whether anyone noticed or not. Bedazzled: Flawless, shimmering stones adorn shoes in every size, color and style. Whether completely encrusted with jewels, or merely a hint of sparkle – get a pair and you won’t be sorry. The Wedge – Once considered a casual style, the wedge has made it’s way into Bridal Fashion through sheer determination. That, and the fact that a wedge is probably one of the most comfortable styles of shoe if you plan to be on your feet for an extended period of time. You can have comfort and style! Platform – To add height, elongate your legs and feel like a showgirl, platforms are a fantastic solution. I various shapes, size styles and colors, platforms are everywhere!!! Designer – The unprecedented success of the Christian Louboutin ‘red sole’ has seen an increase in designer shoe sales. Ladies, if you allow yourself one splurge, this should be it!! Color – Brides everywhere are embracing the color trend and using it to express their individuality, style and love of shoes. My favorite? Something Red, or maybe even something Blue! Can’t decide which trend is best for you? You don’t have to! This sparkle, wedge, platform, designer shoe by Benjamin Adams is dyeable in a multitude of colors and priced at under $400 retail, you don’t have to break the bank! If the Shoe Fits – Buy It! If diamonds are a girl’s best friend, shoes are her lover. Closer to your heart than any other accessory, more personal and more complicated than any one piece of clothing. This makes buying shoes for your wedding very tricky. You want to wear the 4 inch platform pumps that you fell in love with but, can you manage those shoes for this long period of time? You want to be stylish and comfortable at the same time but, it doesn’t always work out that way. There may have to be some compromise. The trend toward self-service has led to an unfortunate side-effect: not knowing what size shoe you should buy. Almost 20% of all women do not buy the correct size shoe so it is important before you set your heart on a pair of shoes that are not suited for your feet, have your foot properly sized up. In addition to the actual shoe size you will want to make note of the width of your foot and (oddly enough) the length of your toes and the arch. If you put on a sandal and it feels comfortable but your toes are hanging over the front, the shoe is too small. If you are trying on a pair of mules and the back of your foot hangs over the back of the shoe, they are too small. If the shoe has more than 1/2 inch of space between the end of your toes and the end of the shoe, it might not be the right size or style. If you can’t wiggle your toes, move on. The ‘toe box’ area should have enough room to wiggle your toes. If there is space around the back of your heel, this might not be the right style for you. Consider a wedge heel since it offeres more support for the entire foot. 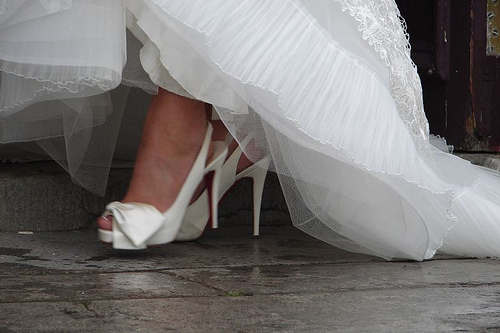 If you are not comprtable wearing 3 or 4″ heels, don’t buy them for your wedding day. You will be miserable all day long. Try a kitten heel instead. Dont buy shoes that are snug thinking you can break them in to fit your foot. They should fit comfortably at the time of purchase. Always try on shoes in the aftenoon or evening. You’ve been walking around all day and your feet are more likely to let you know what feels good or bad. Do wear the shoes a few times to avoid getting blisters from any new stress points. This will relax them a bit and although it will not change the siez, they will feel more comfortable on your wedding day. To really avoid foot pain for your wedding, consider buying a second pair of shoes that are attractive and more comfortable. At he point when your feet become exhausted you can inconspicuously change into the other pair to provide yourself some relief.For the second pair of shoes, select something that will be comfortable for dancing. Just like clothing, shoes are made differently and cut for different shapes of feet. A pair of size 7 shoes can fit two pair of size 7 feet very differently. Talk to the salesperson about how that brand runs. Stuart Weitzman are notoriously narrow and even buying a bigger size won’t solve that problem. Style does not have to be thrown out the window to be comfortable if you shop smart and if the shoe fits…… BUY IT!